Today it has become popular for young people to decorate their bodies with a tattoo. Unfortunately, this is a forbidden act. 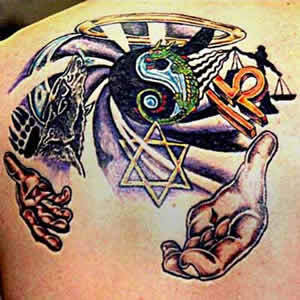 In Leviticus 19:28, the Torah writes: "
and tattoos you shall not make for yourselves, I am the Lord." These are defined as permanent indelible marks made in the skin by a needle which is sunk under the skin that are permanent and can not be removed. A tattoo is made by ink pressed under the skin with a needle. If some one were to only write on the surface of his skin with out the ink going under the skin or if the skin were pierced with a needle, but no writing was made, then the prohibition would not have been transgressed. Therefore one who applies a colored or black ink only picture or lettering to their skins, but it will eventually wash off, have not transgressed. However it is obviously preferable to teach children not to decorate themselves in such a manner in order that they not become used to such decorations, lest they learn to desire a real tattoo. Having a permanent mark put on the skin as a result of a doctor's shot or inoculation, also is not a transgression, since there is no permanent ink placed under the skin. Both a person who makes a tattoo on another person and the person who has the tattoo made in his skin have transgressed this prohibition. Only if the person has no choice and is tattooed against his will has not transgressed. This is as in the case of the victims of Nazis captivity, who had tattooed numbers on their arms against their desires. Since he did not desire the tattoo, but was not given the ability to prevent it, there is no transgression. Our sages have taught that this was the manner of the idolaters who would tattoo themselves to show that they were given to such or other idol. Our G-d requires from us purity of the heart and purity of the flesh. Although we may not see idolaters today who have tattoos, we do see that the type of person who is want to decorate his or her body is of the lowest type, who exhibits the body in a manner to attract others for lewd purposes. The prohibition of a tattoo is a prohibition that applies to both males and females, to all parts of the body whether exposed or concealed. Even a very small mark constitutes a transgression. It does not matter if the tattoo relates to idolatry or not, all tattoos are forbidden. During the time of the Holy Temple, when the Jewish Courts judged the land of Israel, a transgressor would be punished by stripes. However, today, we can not punish transgressors. It is very unfortunate that today we see many young people who think that it is the chic fashionable thing to do, to show that they are modern. Yet styles change, but this mark will go through life with this person reminding him or her of his transgression. Even more embarrassing, others will see it or learn about it and compound the embarrassment that the person will suffer. A person who transgressed and ate non kosher food has his transgression concealed. If the person only eats kosher from then on, who will know? His transgression can be forgiven by G-d. But a person who put a tattoo on him/her self shows forever to the world that he/her transgressed even after getting forgiveness from G-d. It is a very meritorious act for each person who knows of this prohibition to speak out against this travesty, so that the young uneducated youth would know that such an act is a transgression. Perhaps you, by speaking out, will have performed a mitzvah of causing a person to change his or her mind about getting a tattoo. Being kosher is not only the food we eat, but also in the lifestyle we live.